Screw the West! This new role-playing brand certainly does not explicitly say that, but you have to admire a tagline that says it's aiming at a specific type of player in Japan. A niche within niche! The tagline, which you can see in the above image, reads, "An RPG made for 'Japan's particular customers.'" 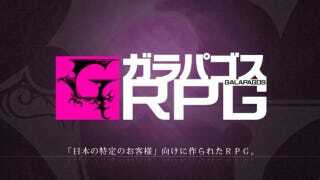 Compile Heart, the folks behind Monster Monpiece and Hyperdimension Neptunia, has a new role-playing game development team called "Galapagos RPG". The name "Galapagos" is from "Galápagos syndrome", which was used to describe Japanese cell phones. It meant that the phones could not survive in the West. As pointed out on 2ch, Japan's largest forum, the first title from Galapagos RPG is a fantasy game, which will go on sale this year in Japan. More details will be revealed on the team's site this Wednesday.